Why Do the Authors on the Small Plates Follow a Pattern? In 1984, John W. Welch observed that after Jacob, some of the keepers of the small plates “do not appear eager to write, nor do they seem to have much to say.” While it is popular to see them as lazy or negligent, Welch continued, “It is interesting, however, that they manifest a strong sense of duty about writing what little they do.”1 Jacob 1:1–4 documents the mandate Nephi gave to his brother Jacob, and Jacob states that he passed this same commandment on to his son Enos (Jacob 7:27). A record is to be kept on the small plates by way of commandment (Jacob 1:1–2). The record must be personally written (Jacob 1:2). The record must be preserved (Jacob 1:3). The record must handed down within the lineage of Jacob from generation to generation (Jacob 1:3). The record was only to lightly cover the history of the people of Nephi (Jacob 1:2). While not every author satisfies every criterion, given the brevity of their writings they actually do an impressive job covering the basics of Nephi’s directive. Each of these writers makes a point of writing in the first person: “I, Jarom” (Jarom 1:1), “I, Omni” (Omni 1:1), or “I, Amaron” (Omni 1:4), thus discharging the personal obligation Nephi gave to Jacob and his successors, as Jacob reported: “that I should write” (Jacob 1:2). Likewise, Chemish and others comment that they will write only a “few things” (Jacob 4:2; Jarom 1:1; Omni 1:4, 9, 22), as Nephi had also explicitly instructed (“few,” Jacob 1:2). Even when these authors know of no new revelations, they typically certify that “I know of no revelation save that which has been written, neither prophecy; wherefore, that which is sufficient is written” (Omni 1:11; see also Jarom 1:2; Omni 1:25). Using Nephi’s command as a template, modern readers can appreciate these small entries for their scribal attention to duty and detail. Although Nephi’s instructions to Jacob are soon forgotten by most people reading the Book of Mormon today, and probably passed just quickly through Joseph Smith’s consciousness as he labored over the task of rendering the text into English, Nephi’s mandate was not forgotten by Jacob and his seven successors. Their diligent adherence to Nephi’s instructions explains why these small books follow a particular pattern in a manner that is worthy of admiration: “Modern readers should not underrate the consistent and subtle way in which the record shows that this command was dutifully obeyed to the end of this line of Jacob’s lineage.”7 While the temptation is to breeze through these brief entries on the small plates, careful reading and thinking about these often neglected voices rewards patient readers. 1. John W. Welch, “The Father’s Command to Keep Records in the Small Plates of Nephi,” FARMS Preliminary Report (September 1984), 1. 2. Welch, “The Father’s Command,” 3. 3. See Welch, “The Father’s Command,” 2–3. Welch actually outlines 8 criteria, but his (5) is not clearly stated in Nephi’s commission but seems implicit in (4), and therefore redundant. For these reasons, it has been omitted here. 4. Welch, “The Father’s Command,” 10. 5. Welch, “The Father’s Command,” 12. 6. Welch, “The Father’s Command,” 12. 7. Welch, “The Father’s Command,” 12, “also” silently omitted. 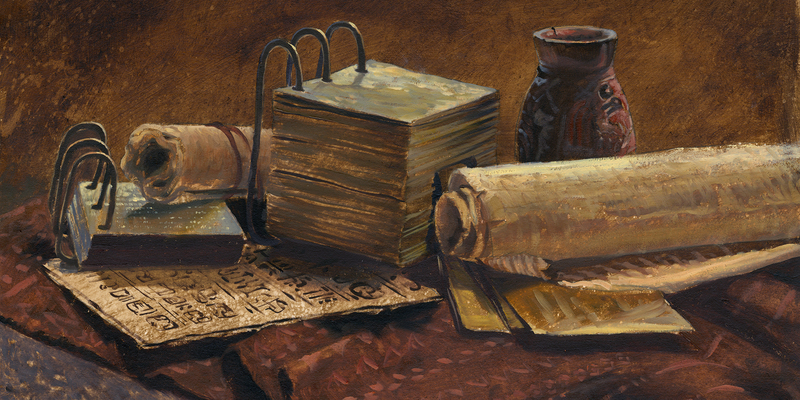 Is the Book of Mormon Like Other Ancient Metal Documents?